Moving Coil Instruments are suitable for the measurement of DC currents and voltages.These are permanent magnet (Alnico high flux density) type with pivot-jewel suspension. The movement is having high torque to weight ratio and linear one with knife edge pointer for accurate reading. The design and construction of instruments is most modern. Sturdiness, simplicity, sensitivity and rigid quality control ensure these movements for high grade performance under adverse conditions of shock and vibration. All instruments are housed in ABS moulded dust proof cases with zero adjuster accessible from the front. Movement Type : Moving Coil permanent magnet type with Jewel Bearing Suspension. Current µA : 50µA to 750µA . Current mA : 1mA to 750mA. Current A : 1A to 30A (Direct), Through External Shunt /75mV, /50mV or /60mV for Higher Currents. Voltage mV : 50mV to 1000mV. Voltage V : 1V to 1000V. Accuracy : ±1.5% of Full Scale for all except MR48. ±2.5% of Full scale for ML48. Zero position : Centre zero or offset zero. Colored dials or markings can be provided as per customer specification. 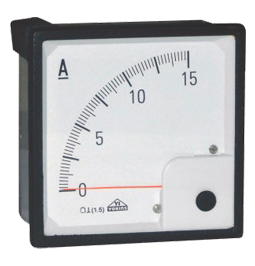 Multiranges : Double range meters can also be provided.